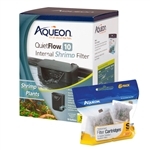 The Aqueon QuietFlow 10 Internal Shrimp Filter is specially designed for freshwater aquariums containing shrimp, small fish and other invertebrates. This filter includes a protective intake grid and pre-filter foam sponge that prevents livestock from entering the filter housing. Includes replaceable small carbon cartridge. For use with aquariums up to 10 Gallons. Aqueon Replacement Cartridge (Small) for QuietFlow 10 Shrimp 6-Pack. The Cartridges should be replaced every 4-6 weeks. 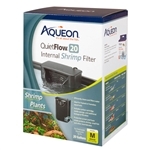 The Aqueon QuietFlow 20 Internal Shrimp Filter is specially designed for freshwater aquariums containing shrimp, small fish and other invertebrates. This filter includes a protective intake grid and pre-filter foam sponge that prevents livestock from entering the filter housing. Includes replaceable small carbon cartridge. For use with aquariums up to 20 Gallons. 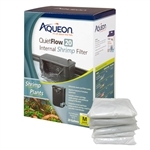 Aqueon Replacement Cartridge (Small) for QuietFlow 20 Shrimp 6-Pack (half of the 12-Pack linked to). The Cartridges should be replaced every 4-6 weeks.